I love quiche, and of course, you can do it crustless for a gluten-free option, but having a crust just makes it look prettier. I really like prettier. And having already successfully used potato slices for ravioli, I wanted to see if it would work as a quiche crust, too. Guess what?—It did! It tastes great, and looks almost like flower petals around the egg mixture. 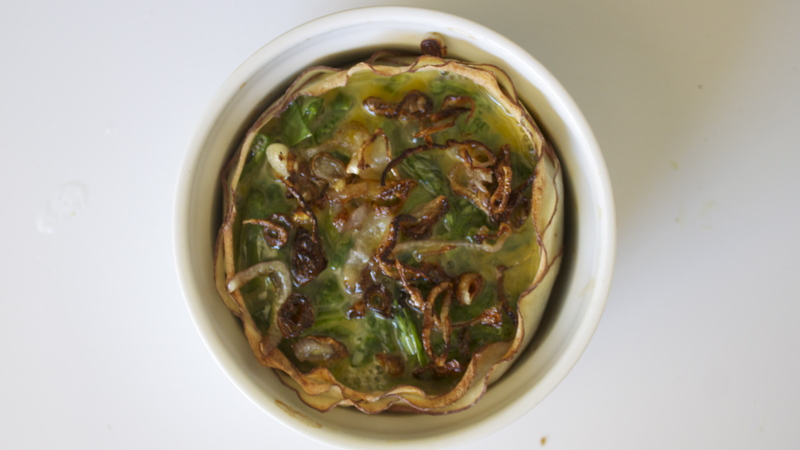 For this post, I made a spinach quiche and sprinkled it with fried slices of shallots, but use this recipe as a base for whatever type of quiche you want to make. 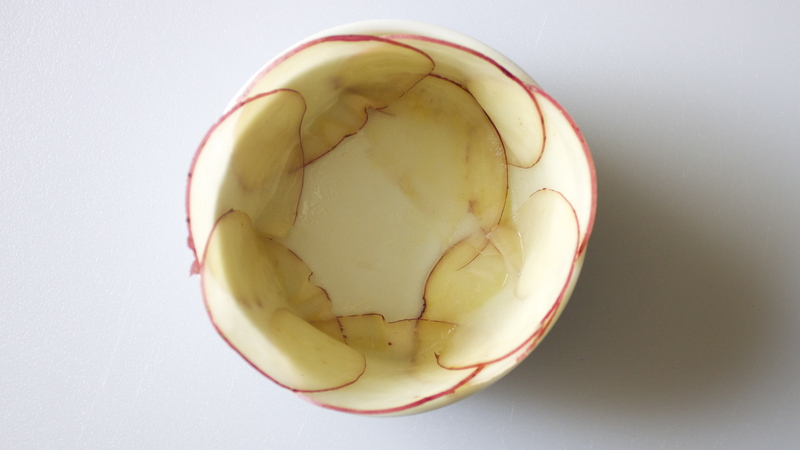 Use the thinnest setting on a mandolin to create potato slices. Coat two small ramekins (mine were 4-1/2 inches) with cooking spray. 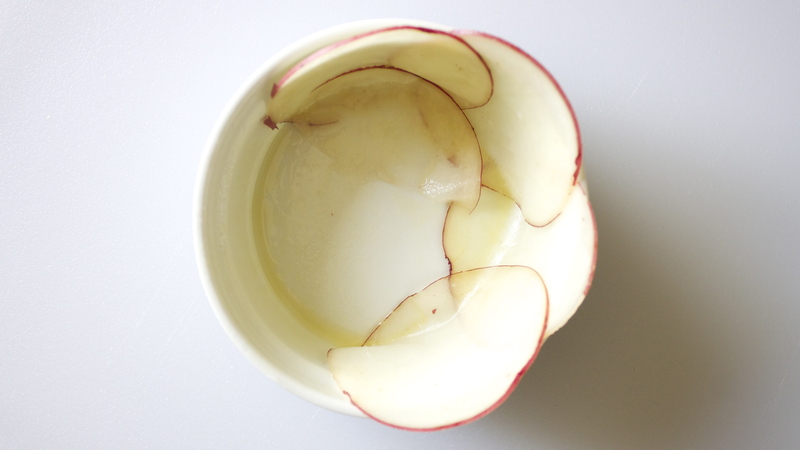 Line ramekins with potato slices, starting with the sides. Arrange so that part of each slice sticks above the rims a little, but also folds onto the bottom. 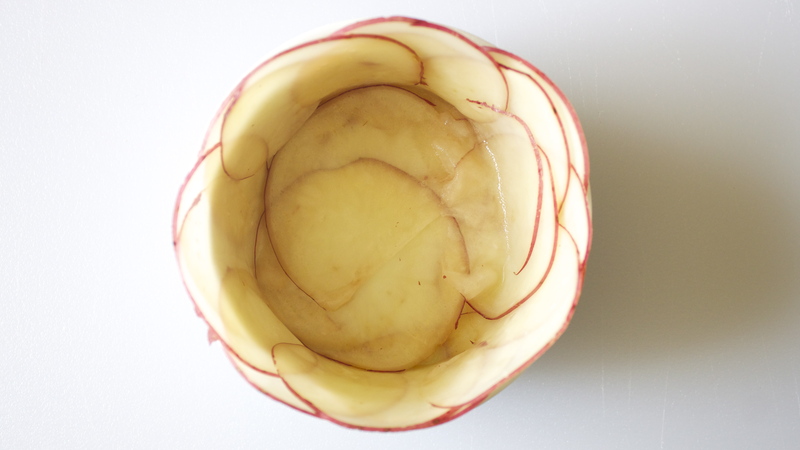 Fill in the bottoms with a few potato slices. Bake potato crusts in preheated oven on the middle rack for 15 minutes. Remove potato crusts from oven, and reduce temperature to 350 degrees F.
Pour half of quiche mixture into each potato crust. 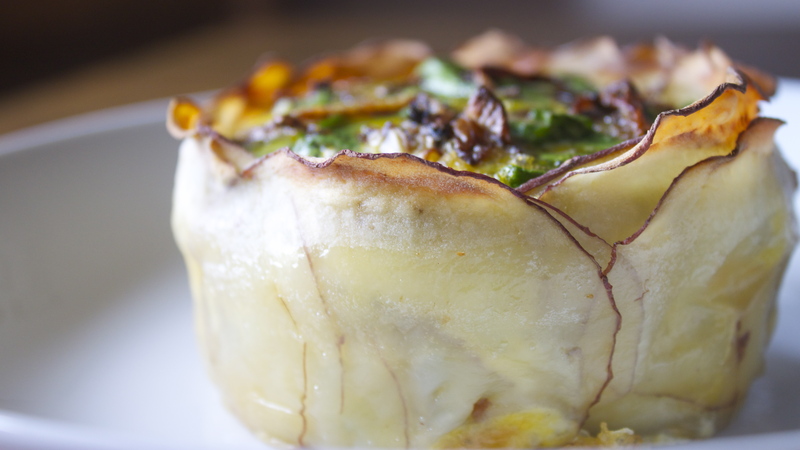 Use a fork to lift each quiche out of the ramekins onto plates. I don’t own a mandolin or ramekins but I made this recipe last night anyways using just a knife to cut the potatoes and a corningware to cook the quiche. My potatoes were thicker so I pre-cooked them for 20 min. The result was awesome. My quiche was so big, we couldn’t eat it all. I reheated some for breakfast this morning in the microwave and surprisingly, it tasted almost as good as yesterday. Thanks for this recipe! Yay!! So glad this worked out so well for you! Would love to make individual ramekins of this “fancy pants” quiche for our Christmas houseguests, but would like to find a way to do some of it ahead of time. Would it work to cook the potato crusts the day before? Hmm…yeah, I bet that would work! After you pre bake the crusts, I might fill them with the quiche filling and then cover and refrigerate…just to prevent the potatoes from getting brown. I keep wondering too if it’s really that necessary to pre bake the potatoes at all. I’ll try that sometime before Christmas and reply to this comment to let you know how it went! Thanks, Mackenzie! It’s such a cool idea! Thanks for the recipe! 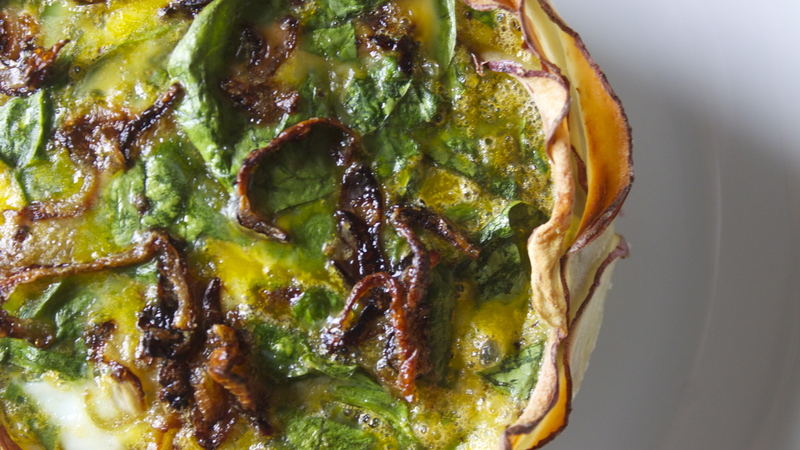 The quiche in the picture looks scrumptious: egg/spinach/bacon? Could you share the recipe for that, too – or your favourite quiche? Hi CJ! Thanks so much for the note–I’m so glad you clicked through, too! As far as the quiche recipe goes, it’s super easy…in addition to what’s listed, I used about a cup of loosely-packed spinach and stirred it in with the eggs (it helps if you massage it a little to reduce the volume). Then, before I put the quiches in the oven, I sliced two shallots and sauteed them in a teaspoon of oil in a skillet on medium heat, then sprinkled them on top of the egg/spinach mixture. That’s it! Enjoy! I WOULD LIKE TO MAKE THIS AS ONE LARGE QUICHE, EITHER IN A QUICHE DISH, 8″? OR A CAST IRON SKILLET. HOW WOULD I INCREASE THE INGREDIENTS AND COOKING TIME. THANKS. LOVELY IDEA. CHANDLER. Hi Chandler! I’ve never actually done it, but here are my recommendations: Slice 1 or 2 *large* potatoes rather than a smaller one, maybe do a double layer of them in the pan so they don’t curl up too much, then prepare your quiche filling as the recipe directs. I would keep the bake time and temp for just the potatoes the same, but increase the bake time for the egg filling to 40 to 45 minutes. Hope this helps, good luck! I am making this for dinner as I type this! Thank you for the idea of using potatoes in place of crust!!! face book. thanks for replying. some people don’t reply. i posted a lot of recipes on group recipes site. if you facebook me I will send you a link to my page. I make a killer quiche, not gluten free, just sinful 🙂 JJ actually it was a FB post by Majestic Moon ranch-Sabrina has a wonderful ranch in Colorado with all the animals 150+ chickens, one named Boogie and is an amazing person. In addition to what’s listed, I used about a cup of loosely-packed spinach and stirred it in with the eggs (it helps if you massage it a little to reduce the volume). Then, before I put the quiches in the oven, I sliced two shallots and sauteed them in a teaspoon of oil, in a skillet on medium heat. Just out of curiosity, I’m getting lots of traffic to this particular recipe–how did you happen come across it? This was posted on the Gluten Free 24/7 FB page, and it’s been liked over 400 times, and shared by a couple of my friends who are also interested in gluten free recipes. 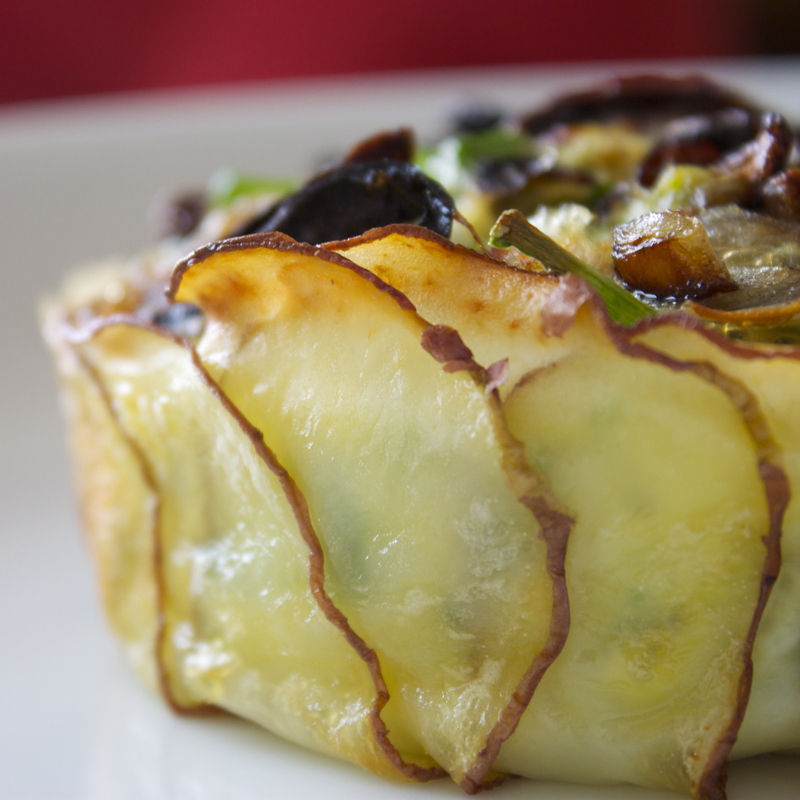 I like how pretty this looks, and, let’s face it, using tasty potatoes is probably better than a gluten-free crust. Yay social media! Happy to find your blog. Hi, me again. You beat 4 eggs and mix in a cup of spinach. That would be fresh spinach opposed to frozen thawed spinach and well drained? A red potato and Large eggs? PS. Is there a way to send you a recipe I believe you will like? I think either fresh or frozen would work just great! 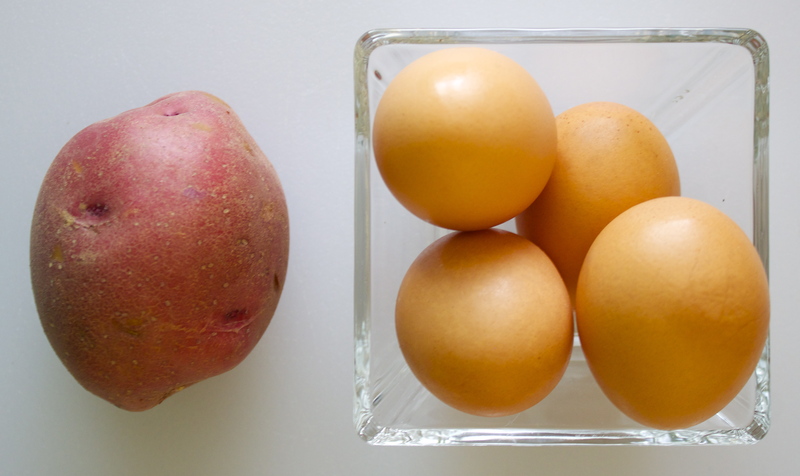 I used red potatoes, but any potato would work, and I don’t get too picky about the size of the eggs…any size should do. Good luck with the quiche! Love this idea! Do you think it will work similarly in a cast iron skillet? My family has needed a new egg dish, so this is right on time! 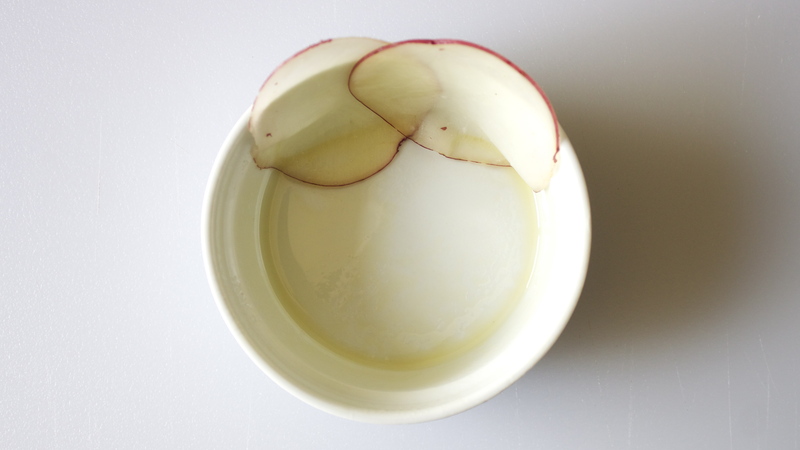 And I love another way to introduce a breakfast staple (potatoes) in a new way! Mackenzie, Have you tried this recipe with any other potato than red potatoes? I wonder whether or not this would work as well with sweet potatoes. Thank you for such a perfect idea! You know, I’ve only tried with red potatoes…it could work with sweet potatoes, but they seem to be a little softer than regualr potatoes, so I’m wondering if they’d slump a little in the step where you’re just baking the “crust” first. But, if they do hold up, once you put the eggs in there, you’d be home free. Let me know if you do try it–I’d be curious to know if how it goes! So glad you loved the idea–I actually had one for breafast this morning and it was as tasty as ever:). Mackenzie, The sweet potatoes worked wonderfully! I just left them in to get a bit crispy and it was delicious! Thank you again for such a splendid idea !! Ooh, that’s great to know! So glad that worked out! I’ll have to give that a try myself:). 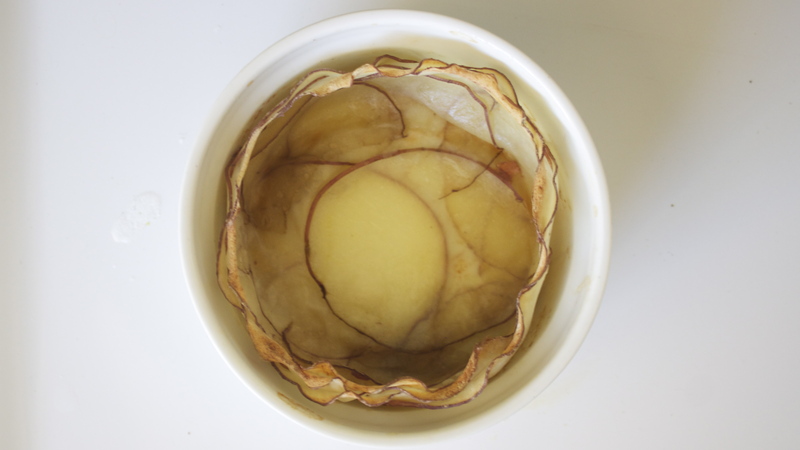 What a great idea; never thought about making a potato based case for a quiche! Thank you so much! I love how the edges of the potatoes get crispy… so delicious! Someone once said to me that a crustless quiche is just a frittata.